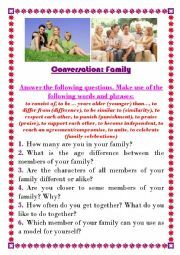 Conversation questions and situations for roleplays. Thank you! Happy New Year! The worksheet is made to check students´ knowledge in verb tenses, passive voice and conditional sentences. The key is included. 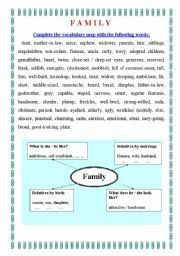 The ws contains vocabulary connected with the topic "Family". The students should fill in the vocabulary map. Have a nice day!